Synopsis: Goodreads Choice Nominee Ralph Webster tells the true story of his grandmother’s desperate journey from her life at the Pensione Alexandra in Naples to America - after Mussolini and the Fascists join with Hitler - and as countries across the world close their doors to Jewish refugees fleeing the spread of Nazi evil. My Review: In 1934, Elsa and her husband Paul have purchased the Pensione Alexandria that overlooks the Mediterranean Sea. They believe that they will live a peaceful life and be financially secure. They are German Jews. However, they are making a living with the pensione. Visitors from all over tell them the story about what is happening in Nazi Germany. Suddenly, the war changes everything. Elsa and her family are forced to sell their beloved pensione and flee to America. Their route to freedom seems bleak because the countries are closing their doors to refugees. Thus, Elsa tells the tale of how she managed to survive. Even though this is a work of historical fiction, it is a true story of the life of the author’s grandmother. The novel is told in first person from her perspective. It starts with her buying the pensione at the age of fifty-one. Her future seems to be promising. She has great hopes when they purchase it. When she hears what is going on in Germany, she is angry. She believes that Jews should be treated fairly as the other Germans. However, she pushes her anger aside and focuses more on her work. It was not until Mussolini joined Hitler that they realized that they were living under a dictatorship with no freedom. They installed new laws that did not give any Jewish rights. Thus, they decided to emigrate. It was a difficult decision for Elsa, but she believed that it was for the children’s best interests. However, refuge seemed impossible. Elsa and her family had to keep searching for a place for refuge until they finally made it to America. Elsa was a strong character, who kept her determination especially when it seemed the odds were against her. 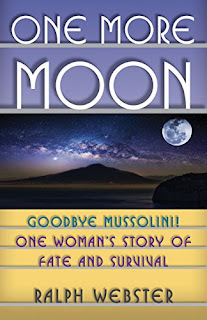 Overall, One More Moon is the story of a woman’s quest for survival and freedom under Mussolini. These people had dreams, but the horror of war shattered their dreams. They were forced to make hard choices. The novel does have a few flaws. It is very repetitive and drawn out. There were a few time jumps that made it confusing as a reader. The novel also strays a bit from the plot. However, One More Moon gives the reader much detail about Hitler’s regime and life under Mussolini. Elsa’s life is a story of resilience and hope. One More Moon is an important novel to read. It is a stimulating book that will linger with you long after you have read the last page. This novel proves that Elsa’s story should be widely known.